Saint Vincent and the Grenadines is a beautiful Caribbean country that consists of 32 small and large islands, stretching from Saint Vincent Island to Grenada. Nine of them are inhabited. With a rich French and British colonial history, the country is now part of the Commonwealth of Nations and CARICOM. Saint Vincent and Grenadines is a popular tourist destination, with a combination of lush tropical forests perfect for eco-tours, magnificent coral reefs around Tobago Keys in the Tobago Keys National Marine Park, fine sandy beaches for sun worshipers, and luxury hotels and resorts hidden among lush vegetation. There is even the live volcano Soufrier to make things interesting. 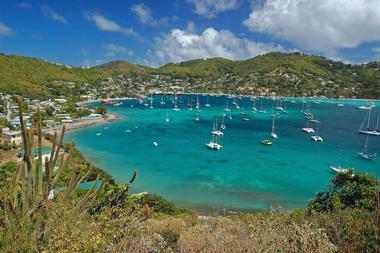 Saint Vincent is the largest island of Saint Vincent and the Grenadines. It is home to a live volcano, La Soufriere, which last erupted in 1979. Its summit is the highest peak in the country. The largest town is Kingstown, a modern, bustling metropolis with about 25,000 people. It is also the island’s main port. The rest of the population lives mostly along the coast. The island’s interior is mountainous and densely forested, and beautiful beaches with black sand (a consequence of island’s volcanic origin) surround it. 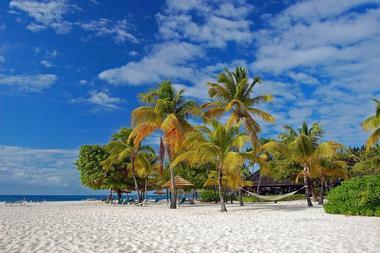 In contrast, the beaches in the Grenadines have white sand. The Vermont Nature Trail is a popular way to get around the island’s spectacular natural scenery and see many island’s endemic species, as well as over 500 native parrots. A scenic coastal trail will take you pass by Fort Charlotte and many fantastic waterfalls, with breathtaking views around every corner. You might even try climbing to the summit of the Sufriere volcano. Bequia, meaning "island of the clouds" in ancient Arawak, is the second biggest island in the country of Saint Vincent and the Grenadines. 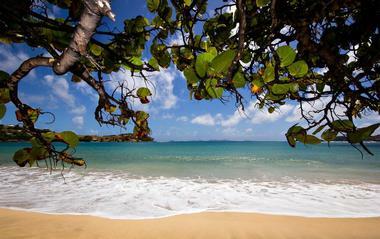 It is located about nine miles from the capital of Kingstown located on the main island, Saint Vincent. 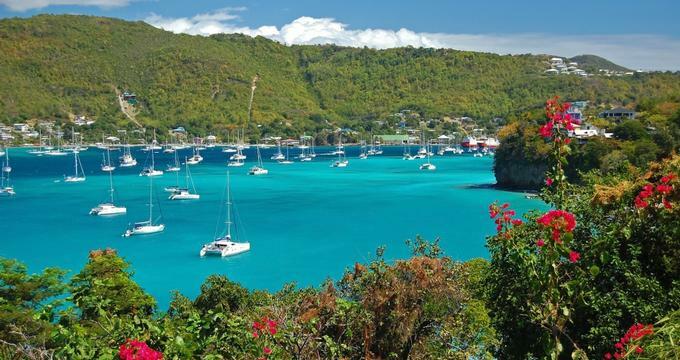 Bequia is a beautiful tropical oasis with white sandy beaches, magnificent coral reefs, lively yachting community in Port Elizabeth, and friendly people. The island is popular with the yachting crowd, and local healthy coral reefs offer fantastic scuba diving, especially at several sunken shipwrecks. Local restaurants, often overlooking the water, are quaint and small, and they offer delicious local dishes. Located about 40 miles from St. Vincent, Petit St Vincent is the southernmost island in Saint Vincent and the Grenadines. Since 2013, the entire island has been converted into a private luxury resort, a part of the Small Luxury Hotels of the World chain of hotels. 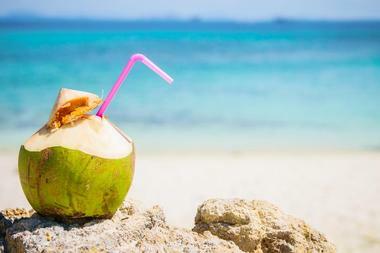 The island is surrounded by miles of fine white sand beaches. The interior consists of green rolling hills and lush tropical forest. The island’s highest point is Marni Hill at 275 feet. Reefs surround the island, and diving and snorkeling are great both on the windward and the leeward coast. There is a network of hiking trails through the island’s lush interior. Island guests can also go kayaking or charter a boat to go fishing or cruising the ocean around the island. The St. Vincent and the Grenadines Botanic Gardens, about one mile from Kingstown in Saint Vincent and the Grenadines, is one of the world’s oldest botanical gardens, preserving rare native and other tropical plants since 1765. Spread over about 20 acres of lush grounds, the garden is an incredibly beautiful green oasis, a peaceful retreat, a historic landmark, and a gorgeous background to many local weddings, celebrations, and events. 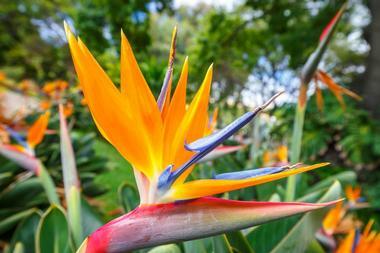 The Botanical Gardens is part of the National Parks, Rivers, and Beaches Authority, and is in charge of preserving and propagating country’s diverse biodiversity. An important part of the garden is the Nicholas Wildlife Aviary, which runs a captive breeding program to protect and conserve Saint Vincent amazon parrot, listed as a vulnerable species. 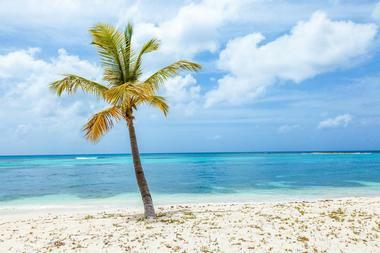 Canouan is a small island in the Caribbean nation of St. Vincent and the Grenadines. A barrier reef protects the island on the Atlantic side. Its interior is hilly and lushly forested, with Mount Royal dominating the landscape and offering magnificent views from the summit. 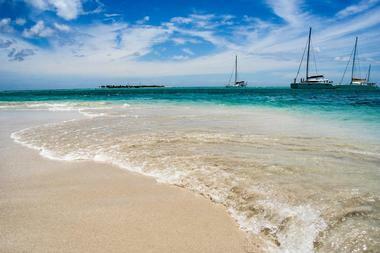 The island is famous for its beautiful sandy beaches. One of the most popular is Grand Bay Beach, located close to Charlestown, the island main town. 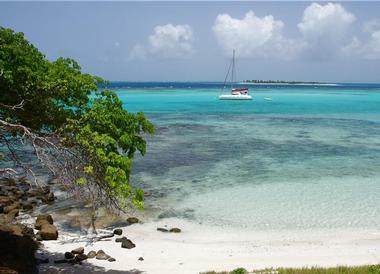 Visitors to the lovely South Glossy Bay can enjoy calm, protected waters and beautiful views of the southern Grenadines. 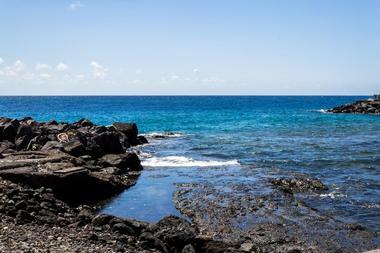 Windward Bay is very different, filled with volcanic rocks that show the island’s volcanic origin. An expedient ferry connects the island with the Grenadines, taking only one hour. The island is home to the exclusive luxury Tamarind Beach Hotel and private Grenadines Estate. Located at the foot of La Soufrière Volcano in the northwest of St. Vincent, Dark View Falls are two spectacular waterfalls that spill from a small Richmond River tributary, one above the other, spilling over the face of a high cliff and dropping into the deep natural pool. A hike from the parking lot to the falls is only about 15 minutes of an easy walk, but you first have to go through a shady bamboo grove and then over a natural bamboo bridge that crosses the tumbling river to get to the falls. It is an adrenaline-pumping adventure, but it is well worth it. The pools below the falls are wonderful for a cooling swim. Just off the coast of Grenadines’ Union Island is a very special island that is home of the local artist, builder, and visionary Janti Ramage. He named his home Happy Island, and you will know why when you come to visit. His home and bar are made entirely of conch shells he scavenged over time from the neighboring beaches where fishermen threw them away after taking out the succulent muscle. Janti took the mountains of abandoned shells that were becoming a local problem and, combining them with bits of exposed coral rocks, created a flat platform that became a surface for his new little island. He built a bar and patio on it and even planted some palm trees, creating a unique Union Island attraction no visiting sailor or tourist can miss. The Grenadines’ smallest inhabited island, Mayreau covers only about one and half square miles and has only one village with no name where everyone lives. The village is perched on top of Station Hill on the south-west end of the island and has a school, the Catholic Church of the Immaculate Conception, a telecommunications building, and a Pentecostal church. 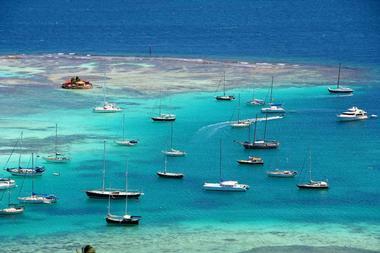 Behind the Catholic Church is an overlook that offers spectacular view of Tobago Cays, Canouan, and Union Island. There is a single-lane road that runs from the Saline Bay through the village to Saltwhistle Bay. Saline Bay got its name because of the salt pond from which salt was exported in the past, but it is now used only by the locals. Most of the islanders are fishermen, the tourism is an important part of the island economy. There is a small resort on Saltwhistle Bay, which is also a very popular anchoring spot for the passing yachts. 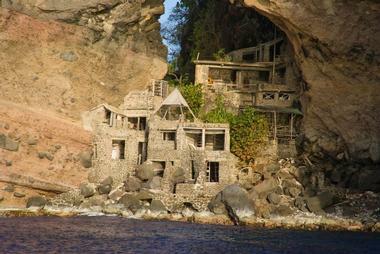 Moonhole is a private nature preserve and community on the western tip of Bequia Island in the Grenadines. Moonhole got its name from a huge arch in the volcanic cliff through which it is possible to see the setting moon at times. Thomas and Gladys Johnston, former NY advertising execs, founded the preserve in the 1960s. They built a house under the arch with the help of masons from the nearby Paget Farm village and created a massive room using native hardwoods, whalebones, and various objects collected on the beach. The room is open on one side to the spectacular view of the ocean. The unique dwelling at first had no electricity, water was collected from rain, and a huge tree grew through the master bedroom. The guest bedrooms were created around a veranda, a central dining room, and a large bar built from a jawbone of humpback whale. The community today has 11 private homes and is dedicated to the protection of this unique architecture, vision, and local nature. Mustique is a private island in the St. Vincent and the Grenadines archipelago known for its magnificent fine white-sand beaches. The most famous are Pasture Bay Beach, Macaroni Beach, and Endeavour Bay Beach. There are not many roads on the island, and the North Point trail runs through wild coastal areas that are home to native seabirds. The island’s west coast has a small village called Britannia Bay, with a collection of small shops and fruit stalls. The tiny village of Lovell is nearby. The island is surrounded by healthy coral reefs and has rich and diverse wildlife and many bird species. 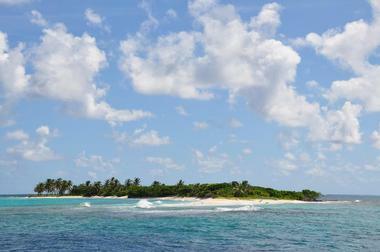 The island is privately owned by the Mustique Company, formed by the owners of island homes. 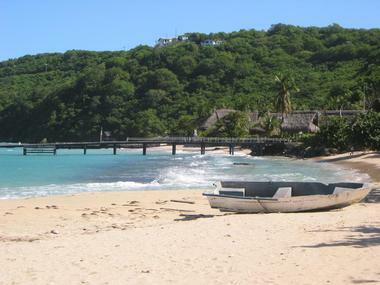 There are about 100 private villas that the Mustique Company rents out. There are also two hotels: the Cotton House and the Firefly. The Owia Salt Pond is located near the small village of Owia on St. Vincent’s North Eastern Coast. The area is inhabited by the Black Caribs, the country’s indigenous people. The “pond” was created by the lava from the Soufriere volcano, which cooled when it reached the sea and formed a small bowl in which salt water accumulates. 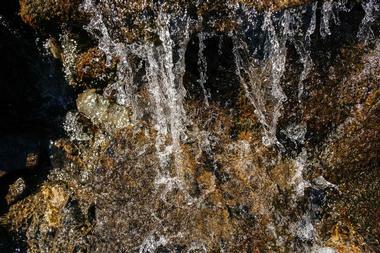 The pond is replenished by the waves that splash over the rocks, keeping it perpetually fresh and at the same level. The pond, which is surrounded by large volcanic rocks that protect it from the ocean, is a popular tourist destination, and many people come to swim in its warm, salty water that is believed to have therapeutic characteristics. The pond is surrounded by well-maintained grounds with a gazebo, fire pits, showers, and park tables and benches. 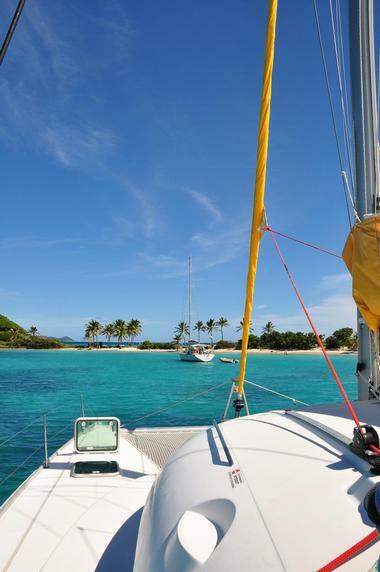 Palm Island is a small island in the Grenadines, about one mile from Union Island. Once a swampy, bug-infested place, the island has been transformed and converted into a coconut plantation by John Caldwell and his wife Mary. Palm Island is today the home of Palm Island Resort and Spa, a luxury 40-room hotel with two restaurants, a pool, gym, and many other facilities. The resort once had a golf course that has since been reclaimed by nature. The island is a heaven for wildlife and birds. It has a number of land turtles, which were brought to replace those washed away by a 2015 hurricane. The most commonly seen animals are geckos, several kinds of lizards, hermit and land crabs, sea turtles, mocking birds, doves, pigeons, sandpipers, herons, hummingbirds, osprey, gulls, and frigate birds. Whaling has been a traditional occupation of Bequia fishermen for centuries. Today the native people of Bequia Island are among the rare world populations the International Whaling Commission tolerates. As for the Inuit people, whale hunting in Bequia was necessary for survival since there were no other resources on the island. Whale hunting in Bequia continues to be a traditional and non-commercial activity. No motor boats can be used to hunt the whales, and their long, elegant wooden sailboats used for whale catching are a tourist attraction. They can use only handheld harpoons and no whale product may be exported. Only four whales can be killed per year. But, the whale hunt is losing its popularity on the island; some former whale hunting families refuse to participate and some seasons no whales are killed. Bequia Maritime Museum is great place to visit if you want to learn about Bequia’s maritime history. 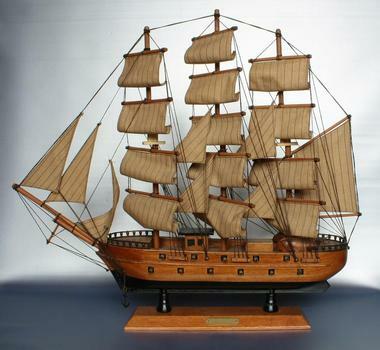 Besides artifacts from the island’s past, the museum hosts a unique collection of model boats made by local artist Lawson Sargeant, including a model of a traditional Bequia Whaler the island is famous for. The museum docents, and often Lawson himself, offer guided tours and tell the story of the island’s Scottish ancestors who brought the art and craft of boat building to the island, as well the whaling tradition that continues to contemporary times. There is also a nice display of old, faded black and white photos of the Bequia oldest schooners built from the 1930s to 1985 and photos of the 1985 Queen of England’s visit to the island. Sea Breeze Nature Tours specialize in introducing their guests to the St. Vincent and Grenadines spectacular marine environment, with a special focus on conservation. They promise to give you an unforgettable experience in the waters throughout the archipelago. You will be interacting with marine animals in their natural environment, whether it is through whale or dolphin watching. 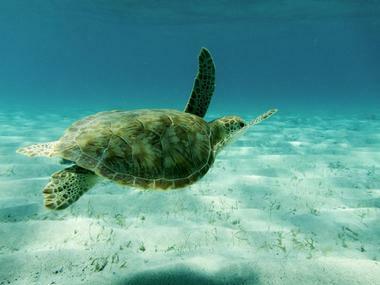 You will see flying fish, marine turtles, and many species of birds. 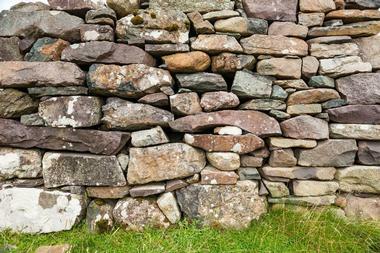 During a coastal tour, you will learn about the islands’ history, culture, and customs. They also offer fishing for any level of experience. Sea Breeze also offers land adventures such as hiking, visiting waterfalls, bird-watching, and island-hopping. The Tobago Cays is an archipelago in the Southern Grenadines, Saint Vincent and the Grenadines. The archipelago has five small islands surrounded by healthy coral reefs. All are uninhabited but are very popular destinations for tourists who are looking for a peaceful, natural environment. The islands are part of the 1,400-acre Tobago Cays Marine Park, which also includes the island of Mayreau with extensive coral reefs and a shallow lagoon with soft sand bottom. The islands are mostly covered with beach vegetation and dry tropical forest. There is also a small mangrove in Petit Rameau. The keys are visited by thousands of tourists every year, mostly in private yachts, but also charter boats from nearby hotels. Most people come for the fantastic diving, snorkeling, and fishing. Tobago Cays Marine Park is a 1,400-acre protected area in the Southern Grenadines, Saint Vincent and the Grenadines. The park has been established to protect the unique environment of a sand-bottom lagoon that includes the five Tobago Cays, the uninhabited island of Mayreau, and the four-kilometers long Horseshoe Reef. Horseshoe Reef is a major bank-barrier reef and one of the healthiest and the most biodiverse in the country. The reefs are home to a large number of coral fish species with the occasional barracuda and jacks. The islands are covered with dry tropical forests and beach vegetation with coconut, cactus, agave, coccoloba, and diospyros as well as one small patch of Red Mangroves on Petit Rameau. The park is a popular tourist destination with divers, snorkelers, and sun-worshipers. Union Island is a small remote island in Saint Vincent and the Grenadines. Off the beaten path for most tourists, it is relaxed and peaceful, a great starting point for a sailing or boating vacation. It is also great destination for scuba divers, and its inland lush vegetation provides great environment for hiking adventures. Mount Taboi is the highest peak at 999 feet and two major towns on the island are Clifton and Ashton. Tourism is the major source of income for the locals, with lively yacht services, boat chartering, dive shops, and hotels and restaurants. One of the biggest tourist attractions is Happy Island, a unique island in the Clifton Harbor, made of abandoned conch shells by local artists. It has a small bar and deck. 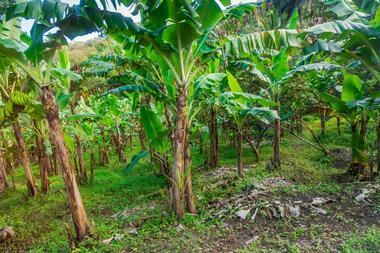 Hiking Vermont Nature Trail is one of the most pleasant ways of seeing St. Vincent and Grenadines’ spectacular nature. Running through the Central Forest Reserve on St. Vincent Island, the Vermont Nature Trail takes hikers through the lush rainforest of the beautiful Buccament valley, where majestic cliffs alternate with sweeping valleys. 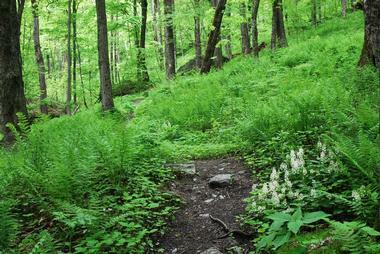 The trail is surrounded with an amazing diversity of tropical trees and plants. It passes through magical St. Vincent Parrot Reserve, where visitors have a chance to see hundreds of native St. Vincent parrots in their natural habitat. The trail is about two miles long and is incredibly scenic. It is mildly challenging as it ascends to the lookout that offers spectacular views of the surrounding forest.